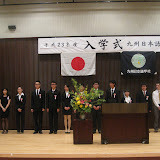 2011年10月生入学式　Entrance ceremony for new students. On 16th Oct. we had an entrance ceremony for new students from China,Hong Kong, Australia and France. We will work hard together to get used to living in Japan and make progress in their Japanese!